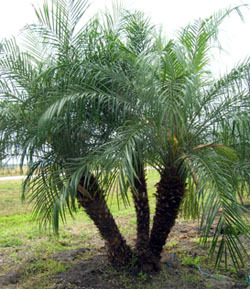 Phoenix-roebelenii, Pygmy Date Palm is one of the most widely used palms in the US due to its relatively small size and graceful lines. It is slow growing, eventually reaching 6 to 7 feet or more. They grow on a single slender trunk with a canopy of 50 or more fronds at top. Nurseries usually sell them with multiple stems from multiple seeds because they look good in clusters of two or more. They are a beautiful tropical addition to warm weather gardens, and they do well in pots around pools and on patios as long as they have sufficient sunlight. They do well in full sun to partial shade. They have low salt tolerance and are moderately drought tolerant. They have no major pests. Rated for zones 10A - 11. This palm is native to India and Burma where it often grows along river banks.